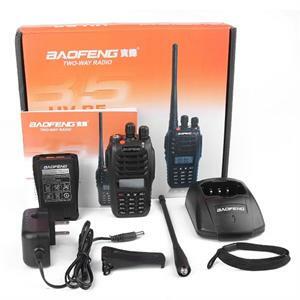 UV-B5: NEW Baofeng dual-band (2m and 440), dual display 5W Transceiver & accessories package. Full-function, digital display, 5W / 1W output levels. Also recveives FM 87-108MHz. Includes Radio, Antenna, Battery, Belt Clip, Ear wrap & Mic, Charger, Lanyard. * Wide frequency range: 136-174 MHZ / 400-470 MHZ & FM radio (65.0-108.0MHz), full-function amateur / professional radio. * Operating keyboard, Dual band / Dual frequency / dual display / dual standby. * Ideal for use in small and medium-sized activities, travelling, car racing, business communication, entertainment industry, and security field.